Interviewer: This mind/brain duality problem is a consciousness issue. It says we can’t measure things the way that we thought we could. We now have to realize that we have to put an asterisk by everything we measure because we haven’t factored in consciousness. Peter Russell: I think it was through just observing my own experience in meditation. I think that has been a fundamental thing is in a way recognizing that all of what we call the material world is actually an appearance in the mind. And in that sense consciousness is really fundamental and comes before the material world in the sense that all I ever know is my experience. And it is out of my experience that comes my ideas and theories and models of what the world is like. And in that sense, just realizing that consciousness is absolutely fundamental. Without consciousness there would be no science. It all takes place in the mind. And yet you could say it is a fundamental tool of science and yet it is totally ignored by science. 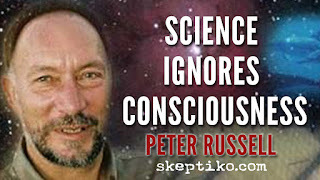 (Peter Russell is on the faculty of the Institute of Noetic Sciences. Speak as your real "I"